Purists will need to cover their ears at this point! This morning, I looked at the map and realised there were several miles of road bashing. Walkers will know that road walking is far harder than even quite hilly walking off-road as every step jars your joints. I was feeling pretty chipper, and the day promised to be hot and sunny, however I didn’t want to wear myself out first thing, so I hopped on a bus from Torquay down to Goodrington Sands where I re-joined the coast path as it turns to run beside the railway. 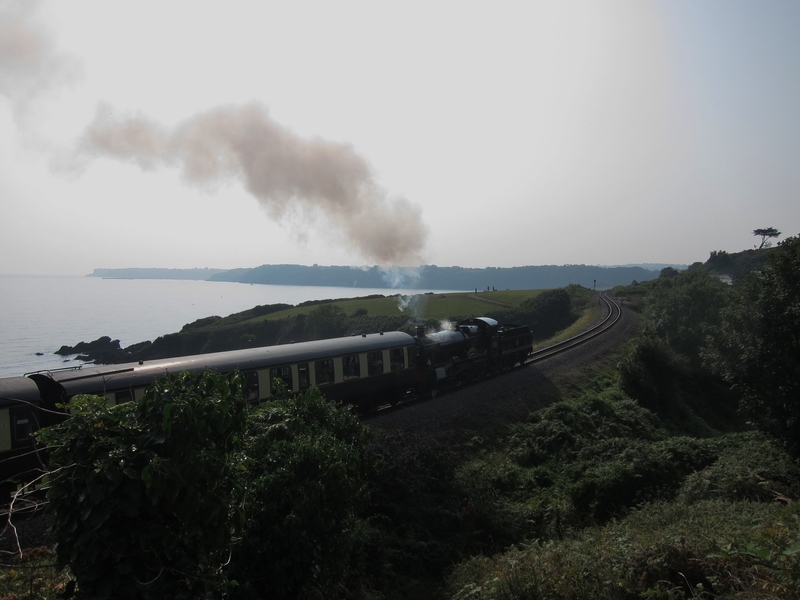 Rather excitingly, I saw a steam train puffing through, packed go the gunwales with tourists. Brixham was absolutely heaving – you could barely stand on the pavements. 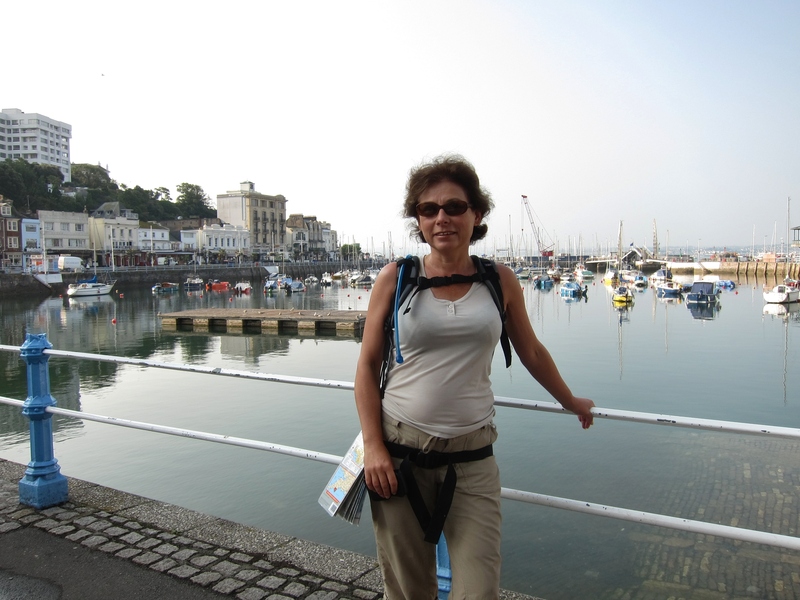 I saw a group of men in orange t-shirts and bethought me of the orange cagoul in my back pack – was there something special about orange tops in Brixham? Apparently, yes: they were congregating at a statue of William of Orange, who landed near Brixham in 1688. I was glad I was not actually in orange, as, despite being generally supportive of William’s statement “the liberties of England and the Protestant religion I will maintain”, he was not very nice to his wife and was perfectly dreadful to the Irish and I wouldn’t want to be seen to be taking part in an Orange march. The town looked very pretty, but I think I’ll come back out of season to look properly. I decided to have an early snack before setting off on the more arduous afternoon stretch, and I was glad I did – see review. 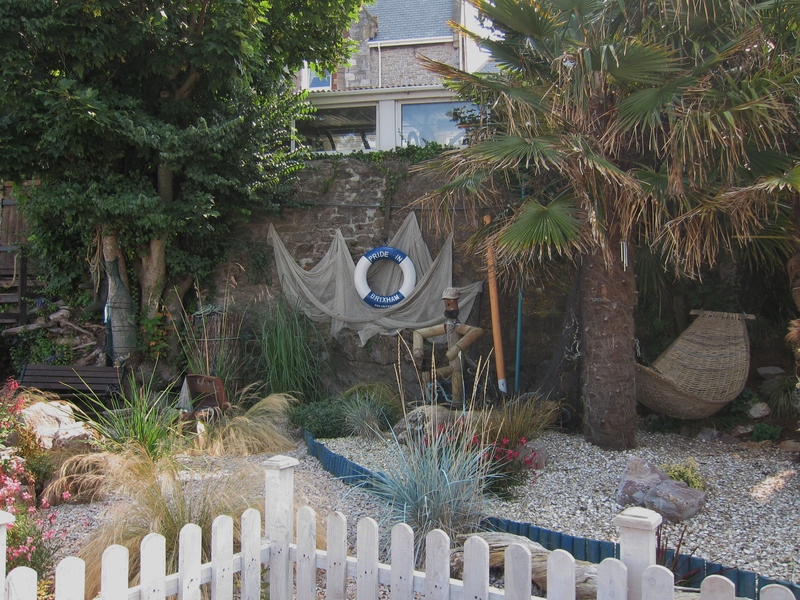 As the path leads out of Brixham there are several pretty gardens, rather like Chelsea show gardens in size, presumably sponsored by local businesses. I have seen nothing today to change yesterday’s view that there is not a single flat space in Devon. The path went up and down over and over again – out to Berry Head, then past several beautiful coves, the path dropping down to the beach then climbing up, up, up to the cliff, then down, down, down to the next. Around 2.15 I decided to stop and paddle at Man Sands, sadly more “sands” than “man”, but it was delightfully refreshing, not to say, bracing for the feet. 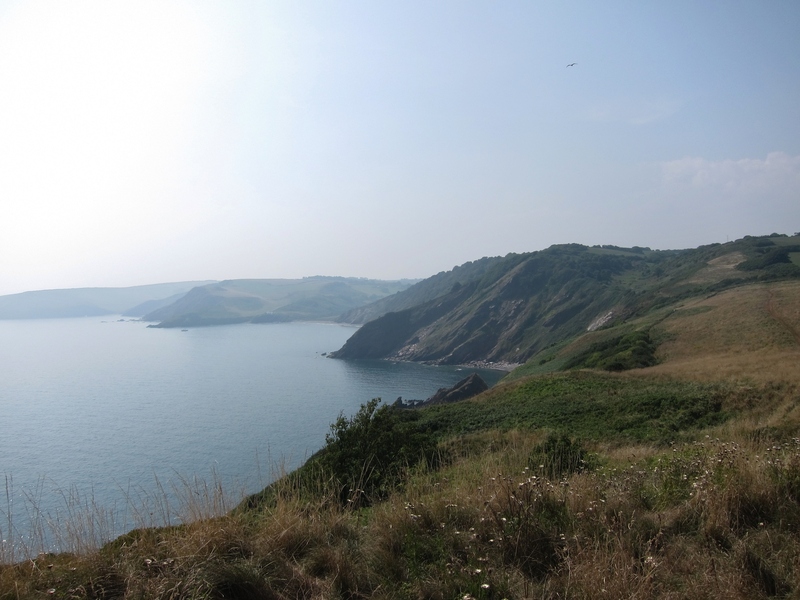 I toiled on, back up to the cliff, wishing that instead of being called the South West coast path, the route were named the “path that stays on the top of the cliff with wonderful views and no ascents or descents of more than 50 feet”. Around Froward Point, the path gets very narrow with steep drops down to the sea. I was glad the rain that came close around 3pm passed over, as I would have been rather nervous if it had been wet. I came across a herd of Dartmoor ponies that were hogging the path, and had to wriggle round them, they seemed entirely unconcerned by my predicament. Eventually, the path makes its final steep descent into Kingswear where I crossed on the passenger ferry – first recorded in 1365, although I am glad that the craft appear to have been replaced. Dartmouth is an absolutely delightful town. The fun fair was being set up for tomorrow’s regatta, but it seemed to have a reality about it that is missing from some of the other seaside towns. I caught the bus up to Strete, advised by my landlady to sit on the top deck, which gave a great view of the many more ups and downs I will need to cover tomorrow.